Melissa Hill is one of my favourite authors. She writes fabulous books about Irish women, mainly facing everyday issues but always with a twist in the tale that keeps the reader on her toes. This is one of the reasons that I love reading her books, and I always try to guess what the twist is likely to be and I am always wrong! Because of this I find her novels fresh and original but also with a formula that I know that I will enjoy. I have just finished reading her book ‘The Truth About You‘ and it did not disappoint me at all. The book starts with a bit of a mystery. A tiny baby has been left on the doorstep of Ella’s café in the tiny quiet town of Lakeview not far from Dublin. No one knows who’s baby it is and why it has been left. Still puzzling over these facts, the reader is then transported a few months back in time and meets the three main characters Nina, Ruth and Jess who all find themselves Lakeview. Ruth was born in the town but is now a very successful Hollywood actress. After an unfortunate drunken night with her handsome co-star, she is hounded by the press when she returns to Ireland and starts to find solace in the peace and quiet of her home town, especially after she bumps into her former boyfriend, Charlie. Nina has broken up with her boyfriend Steve and also returns to Lakeview to live with her distant father in order to lick her wounds. Finally, there is Jess, who although she has never lived in the town, is a constant visitor as her two best friends have moved there with their families. Jess can’t help being made to feel like an outsider though, as she is the only one of her friends without children and desperately wants to join the ‘mummy club’. The three women start to form friendships but they all have something to hide and are not being entirely honest with each other. Oh, and of course, there’s that mystery about the abandoned baby too. Throughout the book I was desperately trying to work out the connection, but yet again, Melissa Hill had a surprise in store, and it was not what I expected at all! ‘The Truth About You‘ is an absolutely brilliant book that explores modern day lives and relationships so well. All three main characters are immensely likeable and you can not help but be drawn into their eventful lives and hope that things turn out well. Pregnancy and babies are a key theme and, as a mother, I found that it was easy to identify with the women’s feelings on the matter. I really felt for Jess and how it felt to be excluded because of being the one without children and could emphasise with her strong desire to join the club so to speak! I think that ‘The Truth About You‘ is a very well written book that held my interest from beginning to end. I liked the way Melissa Hill moved between the three characters in the different chapters but also inter weaved their stories well. As I was reading, I couldn’t wait to find out what was going to happen to each of the women, and as a consequence, it only took me a couple of days to read the entire book. If you enjoy contemporary women’s fiction, I feel sure that you will enjoy this book. 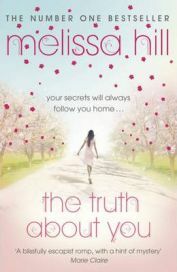 Also, if you have yet to read any of Melissa Hill’s novels, ‘The Truth About You‘ would be an excellent one to start with. With thanks to Hodder & Stoughton for providing a review copy.